Lock in a great price for TRYP - Transit Hotel São Paulo Airport - Terminal 3 – rated 8.1 by recent guests! The hotel is conveniently located in the terminal. Excellent option when you have a long time to wait! Awesome location, getting from terminal 2 to terminan 3 takes 20 minutes walking. This is the best transit hotel I had so far! Super friendly staff and comfortable room. Very convenient. Super friendly staff and great room. Comfortable bed! Very conveniently located. Locación Amazing inside the terminal. We could check in at 9am and leave at 5pm on the same day as we wanted. 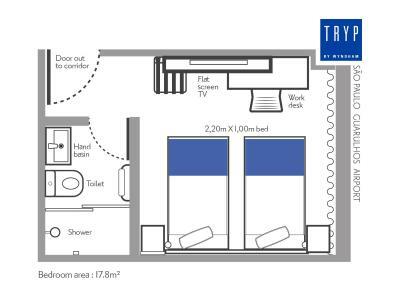 TRYP - Transit Hotel São Paulo Airport - Terminal 3 This rating is a reflection of how the property compares to the industry standard when it comes to price, facilities and services available. It's based on a self-evaluation by the property. Use this rating to help choose your stay! Just passengers with INTERNATIONAL DESTINATION and CHECKED BAGS can access the transit hotel of São Paulo Guarulhos International Airport. 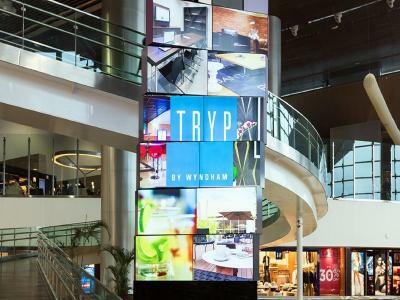 Located inside the international transit area at Guarulhos Airport's terminal 3, in Sao Paulo, TRYP - Transit Hotel São Paulo Airport - Terminal 3 offers modern accommodations with free WiFi access and air conditioning. TRYP Airport is designed only to guests holding a valid ticket with an upcoming international flight departing from the Guarulhos Terminals 2 and 3 (for further information please refer to the Important Information box), or in transit from international flights awaiting an international connection in the same terminal. Each guestroom comes ideally decorated with contemporary décor and furnishing, offering guests a flat-screen TV, a working area and a flat-screen TV. A private bathroom is available with a hot shower and free toiletries. 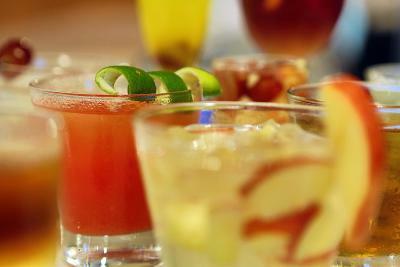 Guests are welcome to dine at the on-site restaurant and enjoy drinks and cocktails at TRYP - Transit Hotel São Paulo Airport's bar. A 24-hour front desk is available for assistance. Every room at this hotel is equipped with air conditioning, a flat-screen TV and a private bathroom with a shower and a hairdryer. 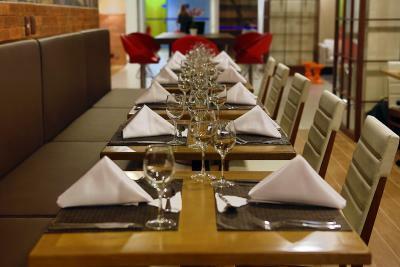 When would you like to stay at TRYP - Transit Hotel São Paulo Airport - Terminal 3? This twin room features air conditioning, a flat-screen TV and a safe. The private bathroom comes with a shower and a hairdryer. 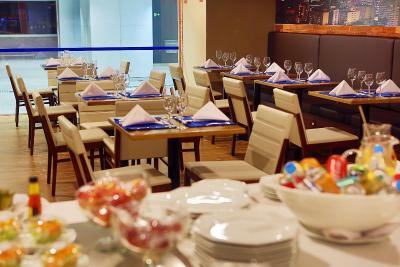 Tryp by Wyndham Guarulhos Airport is located after the passport control area. Please note that only guests holding a valid ticket with an upcoming international flight departing from the Guarulhos Terminals 2 and 3 are allowed to check-in and access this property. This ticket (valid for the day or within the allowed boarding time) and a passport are mandatory and will be required upon check-in. This suite features air conditioning, a flat-screen TV and a safe. The private bathroom comes with a shower and a hairdryer. House Rules TRYP - Transit Hotel São Paulo Airport - Terminal 3 takes special requests – add in the next step! TRYP - Transit Hotel São Paulo Airport - Terminal 3 accepts these cards and reserves the right to temporarily hold an amount prior to arrival. Please note that this property is located inside the international transit area at Guarulhos Airport's terminal 3 and therefore has access restrictions. 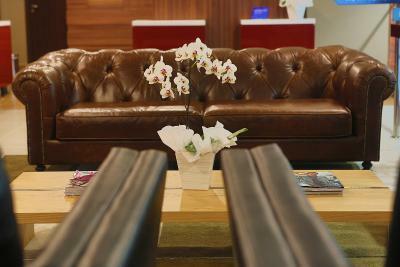 Only guests with international destination will have access to the Hotel, under the following conditions: - From an international flight connecting to other international flight. - From a national flight connecting to an international flight, if the passenger has a combined ticket and the checked luggage. Extra beds are available for a surcharge and are subject to availability. 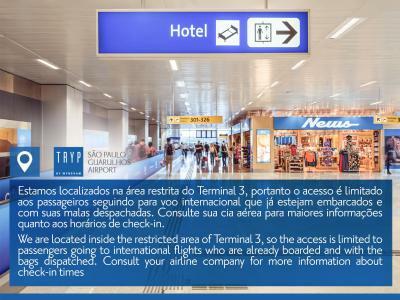 Please inform TRYP - Transit Hotel São Paulo Airport - Terminal 3 of your expected arrival time in advance. You can use the Special Requests box when booking, or contact the property directly using the contact details in your confirmation. Room only had Brazilian power outlets. A USB port or all country power outlet in the room would have been appreciated given the hotel is in the international transfers section of the airport. Nothing - I had to pay to sleep elsewhere. Body lotion would be great! Security and kids play area + just a great location. No ground pepper available.Breakfast too late for early traveller- should be ready by at least 06h00 in the morning . Dinner should be available untill at least 22h00 in the evening.No TV instructions in the rooms on how too choose channels in English. English of most staff poor to limited,creates a problem for international travelers. Nowhere to hang up clothes. My room was equipped as a gym. They charge to use the courtyard that they advertise as being the only open air space in airport (past security). When on a long layover in Sao Paulo this hotel is great as it is in the gate area of the airport and gives you a hotel room to rest and refresh. One of the concerns we had is that they charge to use the courtyard (too bad for smokers!!). Also, book your stay with booking.com as they charge almost double if you go to the property without a reservation. It was better than expected, rooms reasonably large for an airport hotel and the hotel itself was a lot larger than I expected! Extremely convenient and great value for money!